It's been a slow month for copyright law. Trademarks, however, have been a hotbed of ridiculosity. Exhibit One: John Wayne's heirs have filed a law suit against Duke University (which was Trinity College until 1924 when it was renamed in honor of *cough* tobacco magnate Washington Duke) over the trademark rights to the word "Duke." John Wayne was born Marion Robert Morrison in 1907. He was "the Duke" for reasons lost to the mists of time. 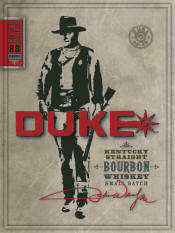 John Wayne Enterprises ("JWE", a company run by his family) has filed suit in federal court in California, asking a judge to find that they can use the word "Duke" on bourbon, tequila, and scotch without infringing on Duke University's trademark. "Duke University is not and never has been in the business of producing, marketing, distributing, or selling alcohol," stated JWE in its complaint. "On information and belief, the actual and potential customer base of Duke University is vastly different from the customer base of JWE." (Again, the "Doc" asks, have they NEVER been on a college campus on a weekend???) JWE concedes the University uses the "Duke" mark "in connection with the sale of its university-related products and services." But, they say, "Duke University does not own the word Duke in all contexts for all purposes." The USPTO database lists 292 registered trademarks that use the word "Duke". Among these are "Daisy Dukes", "Honeydukes", "Duke Nukem", "The Royal Foundation of the Duke and Duchess of Cambridge and Prince Harry", "Duke Kahanamoku" (surf's up, dude! ), "Duke Ellington", "Randolph Duke" (orange juice, anyone? ), and "The Dukes of Hazzard". Where will it all end? The "Doc" is clueless, but hopes that the parties can just decide to have a party, invite Wills, Cathy, Harry, and Pippa (especially Pippa), serve Duke bourbon at Duke University, and bury the tomahawk. Confused? Ask the attorneys at LW&H to explain it to you (especially the Daisy Dukes) since they seem to love disputes over trademark rights, and all other forms of what they humorously refer to as "intellectual" property. Until next month, the "Doc" urges you to trademark responsibly. Friends don't let friends brand confusingly. There are many misconceptions about posting images on web sites and social media. They range from believing everything online is free-for-the-taking to assuming that if you give attribution of ownership to an image, you're not infringing someone's copyright. These assumptions are just plain wrong. Just ask anybody who's received a cease and desist letter and ended up paying thousands of dollars for what they believed was innocent conduct. The following is not a primer on copyright law but just a few principles that you should keep in mind when you're posting to Facebook, Instagram, other social media, or your web site. 1. DO post your own pictures. Let's begin the discussion with a basic principle: If you snapped the picture yourself it's generally yours and you're free to do what your want with it. Post away! 2. DO post "public domain" images. 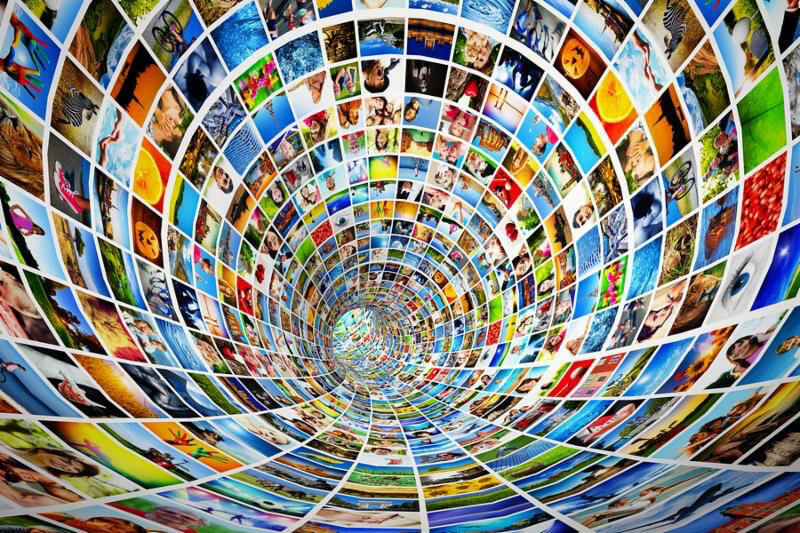 Did you know that there are some great sources of free media files? Repositories, such as Wikimedia Commons, offer public domain or freely licensed images. Some images are still subject to a license, which have attribution or other requirements. Check the license before you post one of these images. 3. DO link to images that you do not own. The Internet is all about connectivity and linking. If you come across an image you would like your friends to see, get permission from the owner of the image to post it on your social media. If you can't get permission, post a link. 4. DO license images that you don't own. If you find a commercial image you like and you want to post it on social media, don's steal it; license it. A license is an agreement between you and copyright owner that gives you the right to display an image that does not belong to you. The catch is that you will in many cases have to pay someone for the license. 5. DO the research before you post. So you've found an image you want to post on social media. You can't identify the owner. How do you determine the source? Unfortunately, it's not easy. A Google Images search is a good place to start. Remember, it's better to be safe than sorry, so if you can't determine the source, don't post it, link to it instead. 6. DON'T believe people who tell you that everything on the Internet is free for the taking. Nothing in the law - copyright or other law - says you abandon your rights in copyright if you post an image on the Internet. Granted, the rights may be more difficult to police but they still belong to the author. And, just for your information, rights in copyright consist of the right to make copies, to make derivative works, and the rights to distribute, perform, and display the work. 7. DON'T believe you won't suffer any consequences if you disregard the advise in this column. Now that you understand that nothing is free, before you post that beautiful image of a sunset on your Facebook page, make sure you have the rights. If you don't, the author or creator of the work has the right to send you a cease and desist letter because you are infringing her copyright. A cease and desist letter essentially says, "stop and take it down or I'll sue". Okay, so you don't think it's worth while to send you a cease and desist letter, after all its only one image and it's just little you who is posting it. Don't bet on it. Copyright law makes it worthwhile to sue by penalizing infringers with statutory damages (i.e., damages that are not tied to actual damages) and attorneys fees (and lawyers can be expensive)! 8. DON'T rely on "attribution" to save you. Some people think that it's alright to post images that belong to someone else if you attribute their ownership (of course, this assumes that you know who owns it). Sorry, but copyright law says that although an author has a right to proper attribution, it does not say that simply identifying the author relieves you from the obligation to obtain the right (i.e., a license) to display her work. 9. DON'T use stock images unless you have paid for them under a valid license. Companies like Getty Images and iStockPhoto are in the business of selling photographs. If you use one of their photos make sure you have license otherwise you risk receiving a threatening "nastygram." How would they know? Many stock and other commercially sold images have embedded watermarks or "fingerprints" that special software can detect. Some lawyers have created a business out of crawling the web looking for stolen images and sending cease and desist letters. Beware! 10. Fair Use is hard to predict; DO ask a lawyer before assuming that your activities are protected. For purposes of "criticism, comment, news reporting, teaching...,scholarship, or research" you can use images belonging to others without securing their permission. This is called "fair use." Be careful though, fair use is subject to many limitations including the amount and substantiality of what you're copying, the purpose, and whether you are benefitting financially from the work. There is a vast body of law related to determining fair use so its wildly unpredictable, and it's expensive to guess wrong. Best to see a lawyer who specializes in this area of the law before you post an image and claim it's fair use. 11. DON'T panic if you receive a cease and desist letter. No need to panic if you receive a cease and desist letter. Many times, copyright owners will settle infringement claims for modest amounts and many times they will be willing to negotiate. If you have concerns, hire a lawyer. Congress, that is. Several patent bills are pending, most of which will make it more risky and expensive to enforce a patent or defend against a patent infringement action in court. These bills represent the second half of the America Invents Act, which changed the patent landscape in 2011. The major House and Senate bills have substantial support in both parties and the President has stated that he will sign whatever patent bill Congress can pass. The opposition is also organized this time, so there should be an actual debate. Of course, the patent bills are not yet law and will not become law until passed by both the House and Senate and signed by the President. The following are some of the major changes in the bills. a. The bills include 'loser pays' provisions that would substantially lower the standards for shifting attorney's fees to the losing party in patent litigation. Under the new bills, the loser would be liable for ALL of the winner's attorney's fees if the loser takes a litigation position or engages in conduct that is 'not objectively reasonable.' Under the bills, the stakes of patent litigation will become even higher. The attorney's fees provisions apparently apply to both infringement litigation and to declaratory judgment litigation by an infringer against a patent owner to determine whether a patent is valid. Under current law, the loser in patent litigation can be tagged for the winning side's attorney's fees in 'exceptional' circumstances in the discretion of the trial judge when the loser engages in bad conduct or takes meritless litigation positions. Recent Supreme Court decisions have made attorney's fees in patent litigation more widely available; however, fee awards have been limited to the winner's attorney's fees caused by the loser's bad behavior. If the bills become law, the fees are not so limited and the risks of patent litigation are substantially increased. b. The bills would require heightened pleading standards to file a patent infringement lawsuit. The pending bills would require that persons asserting patent rights identify specific patents, specific claims, specific product, and identify how the specific products infringe each of the elements of each claim. This is a much higher pleading standard than is required in other litigation in the Federal courts. c. Patent demand letters ('cease and desist' letters) will become effectively extinct if the bills become law. The requirements for demand letters will be the same as for filing a lawsuit in Federal court. Under one pending bill, failure to include all of the required information in a demand letter can invalidate the patent. If the bills become law and you have a patent to enforce, the first things that you will do is to investigate the infringement and file a lawsuit in Federal court. You will not breathe a word to the defendant before filing suit. If you are infringing someone else's patent, then the first notice that you will have is when the U.S. marshal knocks on your door and places a summons in your hand. d. The bills include a 'customer stay.' If the end user (the customer) uses an infringing product and is sued for patent infringement, the litigation against the customer can be stopped temporarily while other litigation against the manufacturer of the product continues, provided that both the customer and manufacturer agree. Matters decided in the litigation against the manufacturer would then be binding on the customer. Common issues (is the patent valid, does the product infringe the patent) need only be decided by a court once and not many times in separate lawsuits. The 'customer stay' provisions have drawn a lot of sound and fury from commenters, arguing that the customer may be a tech giant and the manufacturer may be a mom-and-pop operation in China and outside the reach of the U.S. courts. This author does not see the problem, since the tech giant customer can choose not to agree to a stay and because the stay can only occur if the manufacturer is available in U.S. court. In future newsletters we will take a closer look at the important parts of the new legislation as it moves through Congress.